A Classic YA SF tale that won't be for everyone. Kip from midwest Centerville USA works the summer before college as a pharmacy soda jerk, and wins an authentic stripped-down spacesuit in a soap contest. He answers a distress radio call from Peewee, scrawny rag doll-clutching genius aged 11. With the comforting cop Mother Thing, three-eyed tripod Wormfaces kidnap them to the Moon and Pluto. Note: This version is not currently available on Audible, but physical copies can occasionally be found. The Buy links will take you to the available version. SERIES INFO: This book is standalone. If you have read and disliked others of Heinlein's "Juveniles," you aren't likely to appreciate this one either. But it is one of my favorites. I like the main characters alot; and, except for one section (see below), I really enjoyed their journey. Kip: The boy-next-door who goes on a marvelous adventures and proves that he's a hero. Although he is a bit "gee whiz," he's fun to spend time with. He is definitely a character who thinks, which is something I love. PeeWee: She is highly intelligent, but not always smart. Her capture (which happened before Kip met her) was really her own fault for going off with some complete strangers (even a child from the era this was written in should have known better). That said, I like that she is very practical rather than the type of genius who can't cross the street safely. I also like that this very practical prodigy has a "dolly" she takes everywhere. In other words, she's not two dimensional. She is also slightly less annoying than many of Heinlein's young females. The portion of this book that take place on Earth suffers seriously from having been written so long ago. This is most obvious in the media, and the lack of computers. TV shows are still sponsored by a single company, rather than having modern commercials. And they don't appear to have gotten any more advanced technologically than before either. They had a "swell sock hop" at school. Kip used "honey" & other endearments (that are now more romantic) a lot when speaking with PeeWee. And he referred to someone as a "really likely looking chick," which I don't think was meant disrespectfully (since that doesn't fit his character). It was especially jarring to me every time Kip referred to PeeWee's "daddy" since few teens today would use that term. In fact, as I am writing this review, I am wondering if Heinlein didn't do this on purpose. Although the book takes place in a future where man has moon bases, Earth life was pretty much exactly as was for his original readers. Favorite piece of tech: the "gun" that looks more like a camera than anything else Earth like (since most SF weapons are just sleeker versions of our own). I definitely think that it took much too long to get to the main action. 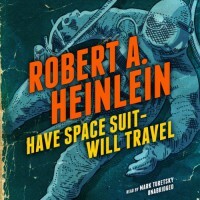 I understand that this is likely because Heinlein was trying to emphasize that hard work can help you achieve your goals, so he had to show that work. I probably wouldn't have minded if the first section as much if it hadn't happened in a "future" that was so anachronistic that it felt like the past. That said, I didn't actually dislike it; I just felt it was too long. I didn't enjoy the whole trial/examination section near the end of the book. I like the way Kip's world has been expanded (on Earth as well) by his adventures, and how he has found a meaningful dream to pursue (rather than just a kid's dream of going to the moon because it seems cool). The conversations with Oscar, he's actually my favorite "character"
Kip's "dead hero" vs "live louse" philosophy. I COULD HAVE DONE WITHOUT: The over abundance of math & electronics stuff (very typical of Heinlein). Especially the implication that I, who never could manage to get an "A" in math once I hit algebra, don't qualify as "educated." / Totally gruesome killing of an alien. The version I am reviewing was done by a Full Cast. They went all out, and gave it the heightened feeling of old-time SF programs such as Flash Gordon or Buck Rogers. All of the actors did a great job. I am not usually a fan of between chapter music, but here it sort of fits the old timey TV show feeling of everything. The "trying not to cry" stuff wasn't very well done, and there was one mispronunciation. Can you recommend a favorite classic YA SF book? Does outdated vocabulary/slang interrupt your enjoyment of a book?